For most of us, our homes are a place of refuge where we get away from it all. Of course, it is the polar opposite for others whose home environments are less than ideal. If you feel that your home requires a touch of sophistication, perhaps the latest Eve Light Strip from Eve Systems will be able to help. 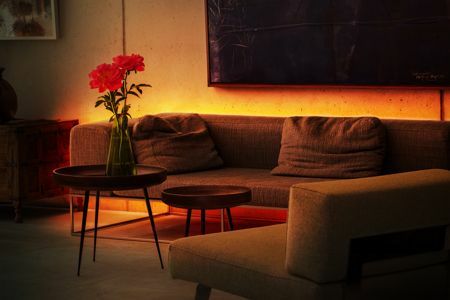 Touted to be the brightest HomeKit-enabled LED strip to date, it will boast up to 1,800 lumens of brightness, sporting a premium triple-diode architecture that is capable of delivering full-spectrum white and millions of colors. Such abilities make the Eve Light Strip perfect for accent lighting in addition to general lighting purposes. The entire strip measures 6.6 feet in length, where it can be further cut at 1 foot intervals so that it is able to accommodate smaller fittings as well as fixtures. In short, items like picture frames and cabinets will not be left out of the picture, and with the option to extend it up to 32.8 feet, you can always use the Eve Light Strip to adorn stairways and suspended ceilings, helping flood whole spaces with shadow-free light. Merging HomeKit technology with Wi-Fi networking, the Eve Light Strip will do away with the need for a bridge, where installation is a snap followed by a near fully automated functionality. When it is hooked up via Wi-Fi to an iPhone, HomePod, or Apple TV, the Eve Light Strip guarantees a simple setup. Its flexibility allows it to be bent around corners for a greater degree of visual creativity in and around the home. Delivering 1800 lumens of brightness, you get to enjoy whole-room ambience with the ease of using voice controls via Siri to switch it on/off, dim, and brighten. Expect the Eve Light Strip to retail for $79.95 as it is made available to the masses from this coming February onwards.